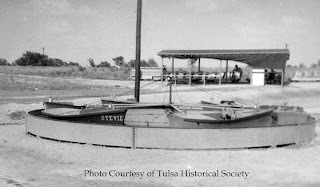 After my blog about Tulsa’s old Amusement parks, I had some inquiries about Lakeview- namely: did I have any photos of it “back in the day” that I could share? 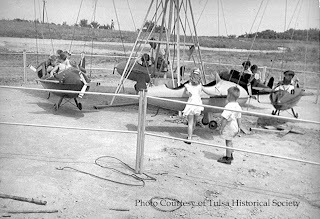 Ironically, just last month I scanned some photos of the old park for the Historical Society’s newest exhibit on Tulsa in the 1940s (which is now open!). Realizing that not everyone lives here in Tulsa to go by and visit the exhibit, THS was kind enough to let me post some of them for your amusement (sorry, I couldn’t resist). 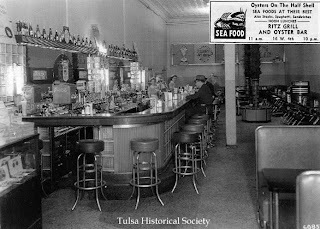 An announcement in Billboard Magazine (June 1947) stated “Tulsa, OK: Cliff Wilson, head of Wilson Distributors and Cecil Elifritz, local restaurant owner, are opening a new amusement park which is scheduled to begin operating July 1.” The article went on to say that the partners were investing $500,000 in the park that would cover 15 of the 40 acre tract with the remaining 25 acres to be used for parking and picnic areas. Cecil patterned the park after the famous Fairy Land Amusement Park in Kansas City and hired architect Joe Koberling to design it. He devoted 1/3 of the park to kiddie rides. A native of Bartlesville and owner of the Ritz Grill that was downtown, Elifritz got into the amusement park business mainly because he liked working with children, delighting in their laughter. There were, however, a few roadblocks along the way. The recent WWII had caused a shortage in materials for construction of major buildings and new rides were few and far between. When the park was finished, it opened in July of 1947 for a 6-week run. There were 6 kiddie rides, 2 major thrillers and a ferris wheel. “We were lucky to have what we did!” Cecil stated in an interview. Elifritz headed to Hollywood to purchase more equipment. While there he acquired a ride called the Lindy Loop from a man who leased rides to movie companies. The Lindy Loop appeared in Will Rogers’ movie “State Fair”. When the park officially opened for it’s first of many 8-month runs in April of 1948, the offerings were much more. 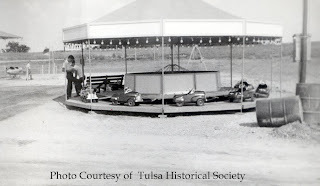 Lined along the 200 by 600 foot midway were such devices as a Whip, Scooter, Dodgem, Spitfire, Pretzel ride, the Lindy Loop, a standard sized merry-go-round and Ferris Wheel. For the kiddies, there were miniature versions of the merry-go-round and Ferris Wheel along with a stream-lined train, boats, airplanes and car rides. 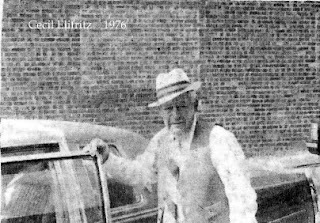 When the Crystal City Amusement Park closed in the mid 1950’s, Elifritz bought many of their rides to add to the fun. Lakeview Amusement Park was located at 4200 North Harvard, across the street from the entrance to Mohawk Park. Poor health forced Elifritz to close the park in 1976. This park touched many Tulsa families. Businesses held company picnics there and there was always Dollar Weekends where kids could ride all of the rides for $1.00. There are many memories of people walking shoulder to shoulder along the midways, with a hot dog in one hand and a snowcone in the other. For photos taken in 1989 and 1993 of the remnants of the park click here. Great Photos and I recall the amusement park very well... A former Tulsan! I remember the company picnics that my Father's company (British-American Oil Co.)had at Lakeway. We'd get free tickets to use. I'd stay all on the bumper cars and come home with a bruised back. Toward the end of the day would be the company softball game where the semi-sodden adults would play, often letting us youngsters participate, frequently as runners for the adults who only wanted to hit the ball, not race around the bases. Sometimes there would be more events inside in the evenings. I love this February 12th post although I just saw it today. I went to school with Jeanne Elifritz many, many years ago in Tulsa. Thanks for sharing the story and the pictures about Lakeview Amusement Park. It does bring back memories and we loved to go to the park. Maybe Jeanne will see this post. I'm so happy you wrote about this amusement park. I drove by there just yesterday and thought about it. Remember going there often in my younger years. Don't recall now when exactly that was, probably in the late 50's, early 60's. I recall a time or two going to see a pow wow, with my GrandDad, on the front of that property, or maybe next door to the north. You did enter through the same drive, however. Loved going into the arcade to play the pin ball machines. Thanks for posting about this park. Fun memories. If you're an adventurous type of person, you can camp, trek, and commune with nature in the region's national parks which stretch from Cape York to the lush Whitsunday islands. I never met Cliff Wilson but I know that he ran one of the first portable arcades which could be transported from fair to fair. Back in 1972, I joined up at Summerfest back in Milwaukee. His portable arcade with its pinball machines was being ran by a Ray and Mackie. Never did get to know their last names. Ray and Mackie were from Tucson. I made good friends with their only employee at the time, Jerry Langhorne Smith. He came from Hannibal, MO. Never did find out later if Jerry lived longer. See, he had emphysema and I helped save him once with CPR because his breathing became restricted. Jerry got me into the CW scene. Since 1972, nobody ever kept in touch however. My dad use to take us oon Sundays after church when they had dollar day! It was the best time. We need that back here in Tulsa! Well, where do I start. My Grandfather was "Ernest E. "Pop" Moody, he ran all the concesions and Bingo at Lakeview, I believe it was a deal he had with Fritz. My Dad and Mom worked for him and so did I as a 10 year old kid. I ran the "Penny Pitch, Ballon Darts, Coke Bottle and Milk Jug pitch and Six cat. If there is anyone who worked for "Pop"in the 50's please post a comment. I would like to hear from you. I remember as a kid that our family would cater Martin's Bar-B-Q for the Cattleman's Club each year that was sponsored by the movie actor John Wayne. We would serve Martin's Bar-B-Q at Lakeview amusement park and get to ride the rides and meet many people that came through the lines to eat. Todd, my father took us to Martin's Bar-B-Que often, it was one of his favorite places (and ours). Thank you for sharing your memories of this park. I had many a birthday at this park. So sad to see it go but I love hearing and seeing this blog. My Grandfather, Todd Carrigan, ran the bingo in the late 50s and early 60s. He also worked on other things in the park. I remember the penny arcade and Laughing Lil. I worked for Mr. Carrigan at Lakeview Amusement Park for 2 summers in 1961 and 1962. I ran all the rides at the Park. New employees start with the kiddy rides. I worked my way up to running the Bumper Cars. Mr. Carrigan gave me some free tickets for my friends from Northeastern Oklahoma A&M Junior College in Miami, OK. when they came down in 1962. Dollar Day was always packed. Ron Ballew, Tulsa Central Class of 1959, NEO 1962, and OSU 1965. AbandonedOK.com has a page about Lakeview that includes an aerial map showing the remains of the park that were still standing and visible in a satellite image from 1995 (available through Google Earth). The park is more clearly visible in the June 13, 1954, and September 10, 1967, USGS aerial photos, available through earthexplorer.usgs.gov. Lakeview was southeast of Harvard Ave. and Mohawk Blvd., south of Lake Yahola. There is an ad for Lakeview on page 14 of the 1962 Memorial Day newspaper supplement (published to run in both the World and Tribune), available through Tulsa Library digital collections. Open 1 p.m. to midnight, free admission, 10 rides for 75 cents for children under 12, and balloon drops with free rides and prizes at 1, 3, 5, 7, and 9 p.m. The address was given as 4100 N. Harvard, which is misleading, as the park was on the east (odd) side of Harvard and south of the midline of the section, which would have been 41st St. N.
My grandmother had a bait shop across the street from Lakeside. Spending summers there, we would get a ticket to go across the street to the park. I have definite memories of that place and time. Lakeview was the best and ive shared many stories about it through the years. The penny arcade was great fun and you have to wonder if those games are still alive today. The fun house and the ride next to it was my favorite. I don't recall the name of that ride but for years the platform it was on would tilt the canvas covered cars on an angle as they ran around and round.The rollercoaster at the park south of Jenks (brain-freeze) was terrific, and the turnpike car ride at bells was good but as a kid I enjoyed Lakeview the best. While in London years back I bought a small paper bio booklet of Leon Russell.I was surprised to read that he had considered buying Lakeview but was discouraged by money managers against it. I have wondered if there might have been a connection to him and that park during his CARNEY days, as the time period was the same-early seventies. So long live the memories of our parks of the past and of OUR CHAMPION- LEON RUSSELL.